We all need goals in life, is yours wine? The Wine Bloggers Conference has a rather intimidating tradition, especially for first-time conference attendees like us. The tradition? Allow me to set the scene for you. There’s a huge conference room full of approximately 200 people, who have already had some wine that day. Okay, more than some. Everyone is at tables, ready and waiting for wine. There’s 25 wineries, ready to rotate every five minutes between tables. In just five minutes, they have to pour for a whole table of 8 people, give us their elevator speech and answer our questions. Meanwhile, we, the bloggers, only have five minutes to get enough information about each bottle, taste it, WRITE something about it, spit/dump the remainder of our sample, and move on to the next one. All of this happens TEN times in a row. Even with spitting, it’s a lot to process! The volume level in the room is super-high, with all of us shouting at the winery reps and them trying to get their pitches out in minutes. If you’ve ever felt pressured to create a tasting note before, this is a whole other kind of pressure! For the Live Red Wine Blogging, my first time, I wrote a blog post while Jeff tweeted. The second time, I tried Instagram out. I posted from my phone, then added comments from my laptop, so I could type more quickly. I think I prefer the Instagram method, especially as it is more visually engaging. Here’s a collection of our thoughts on the ten wines that blitzed by us in a rush! They are presented somewhat like Noelle and “Hubs” did, in their She Said/Hubs Said Live White & Rosé Wine Blogging experience, and I strongly recommend you check out that post for Hub’s colour commentary, especially by the end. A 2015 Roussane from @gardvintners at tonight’s #wbc18 retails for $24. Aged in the #chateauneufdupape style. Got some greasy mouthfeel (in a good way!) #columbiavalley #wineries #estategrown All estate grown grapes, been farming since 1965! They’re also fruit growers. The winery was opened in 2006. 5 different vineyards. They’re the largest estate grown in the WA state!! Great for an old or new world fan. This is a second #roussane #wine from the Lawrence vineyard, called @otiskenyon. The 2017 vintage. This is the wine maker’s great grandfather on the label! He was the first dentist in the #wallawalla area, when another dude moved into town and started taking some business…. SO HE BURNED IT DOWN! His wife responded by getting divorced, moving 10 miles and telling everyone he died. What an awesome #winestory. This is the kind of thing that makes wine super fascinating, buy this for the story, let alone the flavour. It’s a crisp expression, with some lemon and green apple notes on the palate. Ready for some @lecole41 semillon, next up in #whitewine live wine blogging at #wbc18 . They have large diurnal swings to add freshness and acidity. This is 14% sauv, to give it a hint of flint and minerality. Retails for a deal at only $15. YUP. This is a big and bold flavour, I am impressed! Huge punch of mid palate flavour right there. Lovely viscosity, arising from some older barrels to give it a nice, food friendly wine. Fresh vintage! This is a 2018 from the @yealands winery, because the southern hemisphere is so far ahead of us. #newzealand #sauvignonblanc classically. This is another affordable bottle. The @desertwindwine folks are making #chardonnay on one of the hottest pieces (by temperature!) of land in #columbiavalley. This wine is $28 that’s gone through 100% malo fermentation in 25% new french and 75% old french. The result is a smooth, buttery wine, but without a huge oak punch, it’s delightful. This has lime zest coming through as well. Want cool and different? They’re also planting Portguese varietals! Bring on the #albarino from @bodegabouza . They were the first to start growing this, getting things going in Punta Del Este. It has six months on the lees for some creaminess, only 10% is fermented in oak, to give it some flavour. Popular for seafood, shellfish and white meats. Just outside of #montevideo taking their game to the world. The soils are clay and great for viticulture, combined with a nice fresh Atlantic viticulture. Sells for around $20. Certified Salmon Safe! This is a wine from @cvwcwine We’re talking #brothels with a taxi service! This is not a kid friendly winery, so go visit for a good time! They LEAN IN to the branding. There’s even stuff for sale, wink wink. Fun and complex flavours, this does not have the taste I hate in #riesling… I wouldn’t even notice it was a riesling honestly! #wbc18 Shockingly good, I definitely recommend it, as a wine and a destination! Next up is some #russianrivervalley $22 #chardonnay from @rsvineyards Jeff Kralik is here repping them well! Look at the beauty of that pour. A longstanding local family decided to get in on the wine game at @cadaretta, starting in 2005. This is a sauv/semillion blend and their only #whitewine. This is a light, smooth drinking wine with a bit of an acid profile to keep it balanced. Definitely a cool climate style wine, with some hints of floral on the nose. Have we had too much wine to count at this point? Maybe. Maybe. The whole experience was tons of fun, but also totally ridiculous! For more normal tweeting (@aspiringwinos) and instagram (@aspiringwinos) give us a follow! Tired of trying new wines that you want to dump down the sink? We feel your pain. 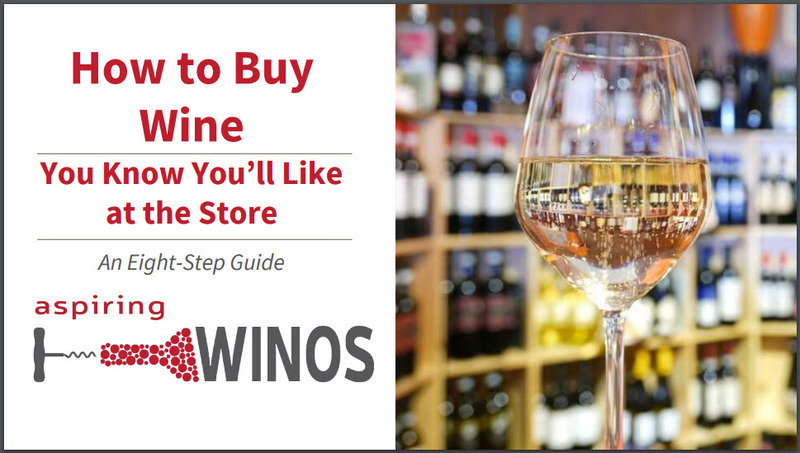 That's why we wrote this ebook to help you find new wines are the store that you'll actually like! Success! Now check your email to get your copy of the eBook. This was our second year doing the Speed WIne Tasting. It does get easier with practice. The first year, I did not manage to get all a tweet out on every single wine. I was far more organized this time, with hashtags ready to paste. I am impressed with the amount of detail that you captured for each wine. Why thank you… they seem so short and lacking in detail, reading them from the calm of home! Pastable hashtags is a great idea to speed things up! Copyright © 2019 Alpine Trail Press - Aspiring Winos · You've made it to the bottom - do you need a refill?